What is the easiest way to keep oneself fit? More so, which exercise is the simplest when it comes to gaining health benefits? Well, without doubt, it’s jumping. You can jump your way through to a whole host of health benefits. It’s some three times more beneficial than either running or jogging. The best part about jumping, it does not involve any investment. You can do it anytime and anywhere without facing any difficultly. Jumping or rebounding can deliver a lot of health benefits if done on a regular basis. That’s why trampoline parks are becoming increasingly popular worldwide for giving prospects of jumping in a safe environment. Trampolining is one of the best ways to keep yourself fit and healthy. Jumping on trampoline park is believed by some scientists to be the ‘greatest exercise invented by man’. A 10-minute of daily jumping schedule on trampolines is equivalent to some thirty minutes of running or jogging in the park. What’s more, you can jump in a safe environment without facing any risk to the body and limbs. You can use mini trampolines and gain fitness at home itself. Scientists have proved long ago how rebounding or jumping impacts white blood cells. With just a 5 or 10 minutes of rebounding, you can see a three-fold increase in the number of your white blood cells. This increased status will last for some one hour after your rebounding session is ended. With more white blood cells, your immune system will get better and you can stay away from diseases and illness for long. . Jumping on rebounding is necessary in order to move the lymph flow in the body. In a way, some sort of physical activity or bodily movement in needed to get the lymph surge. With more lymph flowing through the system, it has a positive impact on the immunity system. This is how our body is kept away from diseases and illnesses. We can clearly see how jumping has a huge impact on the immunity system of ours. Similarly, it helps in releasing of toxins out of the system. Which means, when you jump on a regular basis, it helps clean your lymphatic system. And when lymphatic system is cleaned, all toxins from the body are removed to boost its immunity. Doctors recommend jumping for those desperate to lose weight. Many people enjoy trampolining merely for its ability to help in calorie burning. You can follow a 10-minute of daily schedule of jumping or rebounding and can lose weight in a desired manner. It’s easy and simple and this is why people love doing it to tackle weight problems. Jumping or rebounding boost energy. Yes, it helps in increasing the circulation of oxygen to cells. Which means, more oxygen reaches to the body which makes energy flow. Try jumping for few minutes and you will see the difference. You will surely feel a burst of energy and which is why people like doing this simple exercise. Doctors recommend jumping to those people who have a problem in digestion. When you jump, it involves all the muscles in the digestive track. It lets muscles to contract or relax which cleans out the digestive track. Apart from digestion, rebounding on trampolines is also known to have a positive impact on elimination processes. It’s common for people to complain about fatigue and pains all the time. Medical examinations often fail to find anything in such people. This is where jumping helps and it helps take away pains to different body parts, including legs, neck etc. So, it would be great for you to benefit from jumping and say goodbye to bouts of fatigues. Jumping is good for old and young alike. It fact, it’s the simplest exercise known to the mankind. Even kids would love doing it. Doing this can help you increase bone density and maintain bone mass. The best part, you can maintain bone mass without bothering about the advancing of age. You can include it your daily fitness schedule to prevent osteoporosis. Jumping is a kind of exercise that enhances the bodily flexibility. Doing in on a regular basis means your body will be agile and flexible. It will gain more stamina and endurance. You will never feel bouts of fatigues which is so common in people these days. So, jump on a daily basis and make your body as flexible as you want it to be. Stress and depression problems are quite common these days. In fact, people worldwide are gripped by the menace of both these issues. Jumping can help a great deal in keeping stress away. It helps as it stabilizes the nervous system and is responsible for the release of a mood-inducing substance – serotonin. This substance helps in the same manner as yoga. Jumping is a fun exercise. It’s amazingly simple to do. It helps in digestion and elimination. It is also known to aid in relaxation. The body feels more relaxed when this exercise is done on a regular basis. And only a relaxed body can get a better sleep. In a way, your sleep quality will surely improve when you take to jumping. Doctors often advise people to include jumping in their regular exercise regimen. It brings a whole host of benefits. It keeps stress and depression-related problems at bay. It keeps one happy. And with happiness comes a superior mental performance. Learning process gets sharper in those who do jump in a regular basis. In a nutshell, jumping is quite a beneficial exercise and you should surely include in your daily schedule to gain its myriad benefits. Akshay Sharma is a digital marketing enthusiast and has written many topics in the related field. 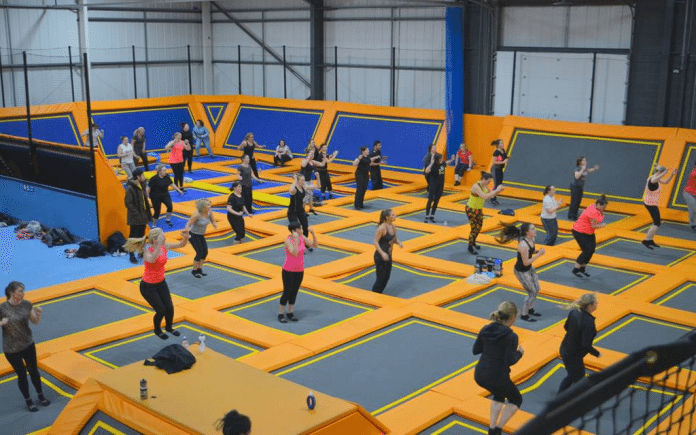 He works with Air Vault, which is counted among one of the Best Indoor Trampoline Park UK.